A building super clears snow from in front of an apartment in Inwood after Winter Storm Juno. After only a half-inch of snow has hit the ground so far this winter, New York City is expected to host its first significant snowstorm of the season over the weekend. But just how severe will it be? Depends who you ask. Some meteorologists are predicting a "blockbuster blizzard for the ages" and a "historic" snowstorm, while others rail against hyperbole. “Every time there’s hype about a storm I start to hear those phrases, and it loses its meaning every time," Rich Otto, a meteorologist at the National Weather Service, told the New York Times. Last year's winter storm Juno, which was initially described as the biggest snowstorm in New York City's history is a perfect example pre-storm hysteria. In anticipation of the worst, the city banned driving, closed schools and shut down its subway system for 10 hours. But in the end, the blizzard swept past the Big Apple, dropping 7.8 inches on Central Park — far short of the predicted 20 to 30 inches. So why are meteorologists and local authorities prone to what some consider overreaction when it comes to storm predictions? ► Computer weather models are often wrong without a hefty dose of human interpretation. In the case of winter storm Juno, the National Weather Service relied on two traditional computer weather models for predicting the nor'easter's severity and course. These models are usually pretty reliable, but they're also known to disagree, and when that happens, human analysis is key, meteorologist Eric Holthaus told Slate. When Juno was about to hit, the Weather Service's snow forecast showed a 67 percent chance at least 18 inches of snow in New York City and it chose to broadcast the worst-case scenario. Meanwhile, the Weather Channel was calling for 8 to 12 inches of snow the night before the storm hit, weighing the results of more models — as varied as they were — a little more evenly. In the end, the National Weather Service issued public apologies for getting it so wrong. In December 2010, when more than 20 inches of snow blanketed the city and paralyzed transit, overwhelmed emergency responders and left roadways impassible, then-mayor Michael Bloomberg was was vacationing in Bermuda. "We owe you and all New Yorkers for that lack of performance our administration’s apology and my personal promise not to let it happen again," deputy mayor Stephen Goldsmith, who was the head of the Office of Emergency Management at the time, told the City Council during a hearing on the administration's inadequate response. Four decades earlier, a snowstorm had almost ended John Lindsay's political career, when the then-mayor thought a walk to survey the damage around Queens, which was hit hardest by the storm, could mitigate the borough's resentment over his clean-up failures. In the wake of that 1969 blizzard, 42 New Yorkers were dead, 288 were injured, thousands of passengers were stranded at airports and train stations, and some roads remained unplowed for a week — all because Linsday's administration was severely unprepared to deal with 15 inches of snowfall. Still, over-preparation is expensive. 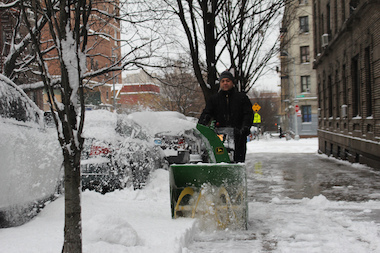 A one-day storm in New York costs the state economy about $700 million, three-quarters of which is attributed to lost wages, according to the research firm IHS Global Insight. So that means at least $525 million is still lost when businesses close to avoid a storm that never hits. ► Sometimes New Yorkers stop paying attention to low-level warnings. After one too many major forecasts that don't pan out, the public can grow distrustful of future alerts of actual crises. Experts say there's a fine line between having people remain vigilant in the face of winter storms and developing storm fatigue, as often happens in the case of tropical storm or hurricane warnings that never strengthen to danger levels. Experts say the best thing people can do is to monitor the ongoing storm and consider the source of the information they're getting. Better safe than sorry.